More than 2400 kilometres away from the golden beaches of the Brazilian capital, this normally nondescript mountain town in landlocked Bolivia hosts one of the largest carnivals in South America. Declared a “Masterpiece of Oral and Tangible Heritage” by Unesco, it’s a riotous celebration of the triumph of good over evil played out in a series of beguiling dances. The main dance, the Diablada (dance of the devil), is a seven-act epic in which a troupe of devils in colourful papier-mache masks do battle with the Archangel Michael. Another, the Morenda, tells the tale of the African slaves who were brought to Bolivia during Spanish colonial times to work in the mines. Dressed in what looks like a stack of baking trays and masks with bulging eyes and outstretched tongues, theirs is a slow, sad dance designed to reflect the exhaustion the slaves no doubt experienced after long hours in the mines with little food or water. Traditional marching bands accompany the dances, performing for nearly two full days along a 4km route ending at the Socavon cathedral, where participants honour the town’s patron saint. This year, the four-day festival runs from February 10-13. 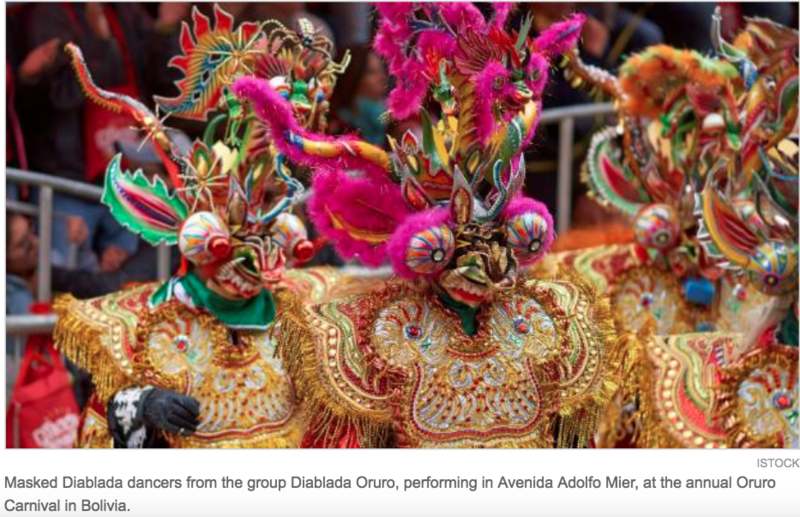 Bolivian Thoughts opinion: I’ve been all over and let me tell you, Oruro carnival is a MUST! come and enjoy Bolivia, we have much, MUCH to offer! This entry was posted in Bolivia, Holidays, Tourism and tagged Bolivian folklore, Bolivian heritage, carnival, Oruro, UNESCO, World Heritage Site. Bookmark the permalink.